This is the third blog in a series responding to the infographic report on racial disparities in Cleveland that I authored in December. You can go back and read the first blog on infant mortality and the second blog on racial disparities in childhood. It would be impossible (and irresponsible) to write anything about the criminal justice system without also writing about race. The racial disparities in the system are astounding and unjust. This blog will focus on youth, among whom racial disparities in commitment rates are actually widening, not narrowing. This is because while many states, including Ohio, have made efforts to decrease juvenile imprisonment on the whole, diversion programs and interventions have disproportionately benefited white youth. As the infographic above points out, this problem begins long before young people become involved with the juvenile justice system. Black children are more likely than white children to be disciplined in school, beginning as early as pre-school. As they grow into adolescence, they are more likely to be criminalized for common youthful indiscretions, while white youth are given second and third chances. And when it comes to serious crimes, which can land young people in one of the state’s three juvenile correctional facilities, it is important to consider the root causes of those violent crimes. Young people who commit violent crimes are often from impoverished communities where gang violence and drug activity are widespread, and access to guns and other weapons is common. It is equally important to address these root issues, as it is to make reforms within the criminal justice system itself. 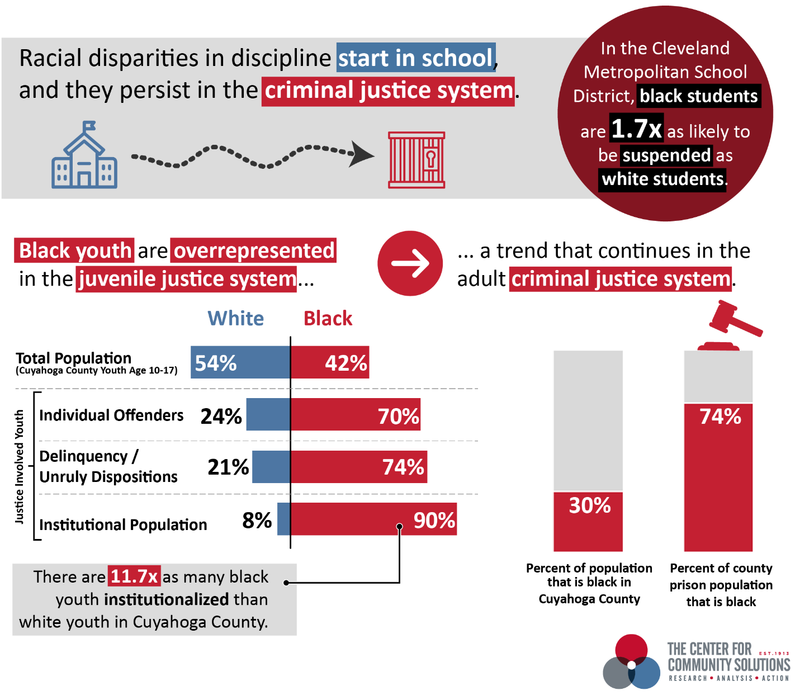 So, what is happening in Ohio, and Cuyahoga County specifically, to reduce racial disparities and protect black youth from harmful interactions with the criminal justice system? What more should we be doing? As of November 2, 2018, House Bill 318, which is designed to improve school safety and keep young students in classrooms by limiting suspensions, went into effect in Ohio. The bill provides additional funding to schools for school safety, and also eliminates out-of-school suspensions and expulsions (except in the case of serious violent offenses) for students in pre-K through third grade. Since research shows that early school discipline is a predictor for future justice involvement, this bill has the potential to be a helpful improvement in coming years as it is phased in, especially for young children of color who are more likely to be disciplined at a young age. The school safety funding can be used in a number of ways, including training for school resources officers, active shooter training and training to “identify and assist students with mental health issues.”  Many advocates recommend that schools focus less on spending funds on school resource officers, and instead focus on improving access to mental health services in schools as an evidence-based practice to improve school safety. This approach could also serve to prevent justice involvement among students. Many advocates recommend that schools focus less on spending funds on school resource officers, and instead focus on improving access to mental health services in schools as an evidence-based practice to improve school safety. Late last year, Congress passed the Juvenile Justice Reform Act of 2018. Title II of the bill “gives clear direction to states and localities to plan and implement data-driven approaches to ensure fairness and reduce racial and ethnic disparities, to set measurable objectives for disparity reduction, and to publicly report such efforts.”  How Ohio will implement these reforms and report progress is yet to be seen, but this is an opportunity for the state to move toward real change in the system that could benefit youth of color, who are frequently not given the benefit of the doubt. The bill also implements numerous system improvements which will have a positive impact on all youth in the juvenile justice system. The bill gives clear direction to states and localities to plan and implement data-driven approaches to ensure fairness and reduce racial and ethnic disparities, to set measurable objectives for disparity reduction, and to publicly report such efforts. In Ohio, it costs the state $202,502 annually to imprison one youth. But youth incarceration isn’t just expensive—it is harmful to young people in countless ways. Enter: diversion programs. Diversion programs are funded in a variety of ways and can take many forms, but broadly, they are community-based alternatives to juvenile detention. Read more about youth deincarceration in this report. The goal is to spend less, keep young people in their communities, and focus on reform, rather than detain them in state facilities. As I mentioned earlier, one challenge with diversion programs is that they frequently disproportionately benefit white youth. As a result, it is important that juvenile courts, police departments, schools and community-based service providers to work together to proactively consider how the system can equitably serve young people, bearing in mind that underlying issues, such as over-policing of poor minority neighborhoods and gang violence in the urban core, are contributors to the overrepresentation of black youth in the system. The Cuyahoga County Juvenile Court is actively taking on the issue of addressing racial and ethnic disparities in its system—the Juvenile Detention Alternatives Initiative (JDAI) has formed a racial and ethnic disparity subcommittee that is actively working to reduce disparities. Youth incarceration isn’t just expensive—it is harmful to young people in countless ways. One issue that came up repeatedly as I researched this system is the glaring lack of available data from both the juvenile and adult criminal justice systems. Only a tiny minority, less than 5 percent, of cases in Ohio’s Juvenile Justice Courts have comprehensive data. The lack of data makes it challenging to fully understand the issues in the system in order to address them (check out this infographic for more info about this data gap). Having access to robust, disaggregated data is vital in order to continue to examine racial disparities within the system and create reform. Having access to robust, disaggregated data is vital in order to continue to examine racial disparities within the system and create reform. In an upcoming post, I will address how Cuyahoga County and Ohio are addressing racial disparities in the adult criminal justice system. Stay tuned.